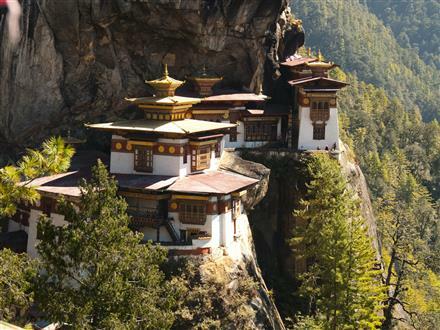 Bhutan or â€˜Druk Yulâ€™ (Mythical Land of the Peaceful Dragon) is as much known for its dramatic landscapes, architecture and bio-diversity as it is for its rich and colourful culture. Explore a land of wonders as you travel through Bhutanâ€™s mountainous terrain meeting deeply religious and peaceful locals who preserve a spiritual heritage. Day 1: (Mon, Thur or Sat) Depart Delhi by Druk Air for Paro (2,134m). 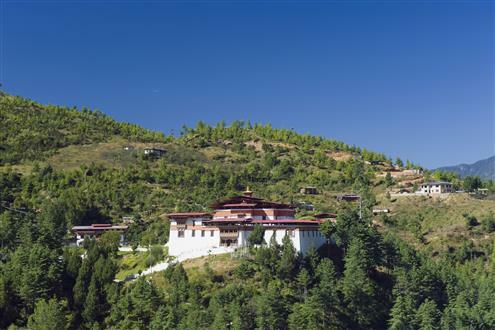 On arrival you will be met and transferred to Paro for a 2-night stay. The drive takes you through picturesque Paro valley with its quaint clusters of hamlets amid terraced paddy fields. (Druk Air operates flights into Paro from Delhi and Calcutta). Day 2: Paro Full day sightseeing of Paro. Hike to Taktsang Monasteryâ€™s viewpoint, the monastery clings seemingly impossible to a cliff of rock at 914m above the valley floor. Drive to Drugyel Dzong or the Fort of Drukpa Victory (14km from Paro). En route visit Kyichu Lhakhang and Satsam Chorten. Continue onwards to Ta Dzong, the National Museum and one of the most celebrated Dzongs (old fortress) in Bhutan, the Rinpung Dzong, or the Fortress of the Heap of Jewels. Day 3: Paro to Thimphu (2,286). Drive to Thimphu, Bhutanâ€™s capital built in traditional Bhutanese style. Visit the Memorial Chorten, built in 1974 in the loving memory of Late His Majesty, King Jigme Dorji Wangchuck, exhibits a multi-storied stupa and numerous paintings providing a rare insight into Buddhist philosophy. Day 4: Thimphu. Drive up to the viewpoint- BBS Tower in Sangaygang. Visit Mini Zoo where you can see Takin, the National animal of Bhutan. The National Library, which holds a vast collection of ancient Buddhist manuscripts; the School of Thangkha paintings (The Arts and Crafts School), General Post Office and the Handicraft Emporium. Day 5: Thimphu to Punakha. The first stop after leaving Thimphu is Dochula Pass at 10,500 ft. (23km from Thimphu), visit â€˜Druk Wangyal Khangzang Chortensâ€™, a unique cluster of 108 Namgyal Khangzang Chortens, Punakha Dzong (limited to the courtyard) and Chimi Lhakhang monastery situated on a hillock. Day 6: Punakha to Paro via Wangdue Phodrang,154 Km/5 3/4 hrs. Visit Wangdue valley, located on a ridge that plunges into the Puna Tsang River flowing below. 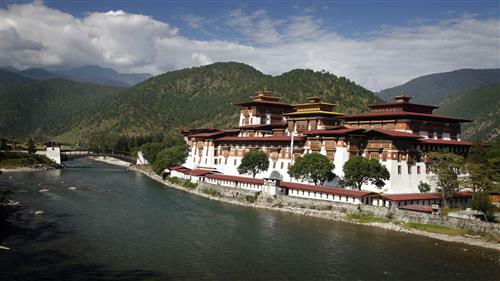 Continue onwards to Paro, en route you will pass by Semtokha Dzong built in 1629 by Shabdrung Ngawang Namgyal. Day 7: (Sun, Wed or Fri) Depart Paro by Druk Air for Delhi. After an early breakfast at the hotel, you be transferred to the airport to board your onward flight.